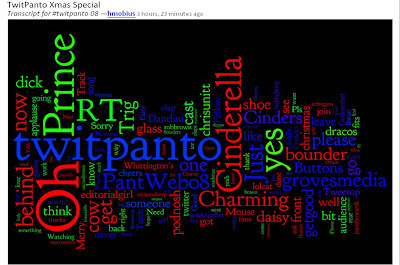 #twitpanto - Twitter pantomime, a new addition to the festive calendar! I wasn't going to blog again until after Christmas, but today saw a virtual pantomime take place on Twitter! For a while today '#twitpanto' was the number one trending topic on Twitter (ahead of 'Merry Christmas' and other seasonal messages.) 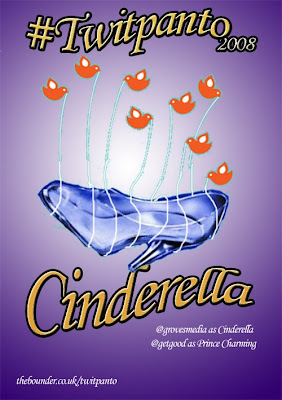 By the time the curtain fell, #twitpanto's production of Cinderella had been responsible for over 1000 tweets and well over 50 pages of Twitter Search results! So what was #twitpanto all about? Firstly, for the uninitiated - Twitter allows a user to post a message / thought etc up to 140 characters long, in the public domain. Other users can then reply to that message, again in the public domain. Messages (or tweets as they are known) can also be tagged with a # tag to enable other users to follow specific conversations. 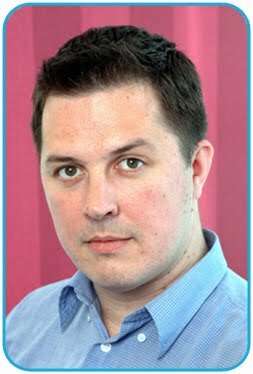 #twitpanto aimed to harness Twitter's functionality to create a virtual, Twitter pantomime. It had a cast of characters who were tweeting their 'lines' and other Twitter users acted as the #twitpanto audience by using @replies - thus a creating a social media pantomime! The use of the #twitpanto hash tag pulled everything together and enabled the event to be followed at large. As the #twitpanto progressed the volume of tweets was extraordinary. We also witnessed creative thinking around the #twitpanto with BlipFM being used to introduced music links and others like Dracos creating Roomatic Twitter hacks to enable the transcript to be followed properly. and Dracos has detailed the full #twitpanto transcript (which can also be downloaded) at Dracos.co.uk. Furthermore, Twitter Search can be used to track the ongoing #twitpanto discussion here. 1) While there was clearly a lot of noise around #twitpanto yesterday afternoon, no-one bought 'twitpanto' as a keyword term. There are people advertising on the keywords 'panto' and 'pantomime', so perhaps 'twitpanto' was a missed opportunity for some cheap traffic? 2) Google's (automated) advanced broadmatching is not able to determine that 'twitpanto' is related to 'panto' and 'pantomime' and therefore is not able to serve contextually relevant ads for 'twitpanto'. As things progress and slang / made up terms get used to group more social conversations (especially using things like # tags) then Google systems and Adwords users need to find ways of being able to interpret language more cleverly and be able to quickly identify emerging trends that can then be piggybacked for traffic.